Get involved! Let’s learn together with #HDRblog15. Writing begets writing. Somehow, the more I write the more I write. The more I think about writing, write about thinking about writing, and write about writing, the more I write. For me, tweeting, blogging and academic writing are all writing practices, ways of thinking and writing my way to understanding. They are also ways of connecting with others. Being part of research conversation and blog conversation and Twitter conversation. Telling stories. Sharing stories. Learning from others’ stories. There are blogs which host posts by research students such as the Thesis Whisperer and PhD Talk. There are active and dormant blogs by research students which can be hard to find in the heaving mass of the blogosphere. And some research students might wonder about what blogging could offer them, but not have the impetus to start. I’m currently taking part in the How to Survive Your PhD MOOC (massive online course) which has expanded my network of scholars, fellow researchers and fellow writers. The course, especially through its discussion forums, #survivephd15 Twitter hashtag and Periscope live chats, has shown how much a community of past and present research students, and supervisors, can gain from engaging with each other. I am keen to build on the momentum of this course, and on the wonderful and generous scholarly Twitteratti, with an initiative that will share the stories of research students who are juggling life and supervision with writing dissertations, theses and journal articles. My answer? The #HDRblog15 blogging challenge. I’ve called it the HDR (higher degree by research) challenge as I’d like any research students (PhD, professional doctorate, Masters), and those involved with research students, to feel welcome to join in. The challenge will be held during the month of November 2015. Its purpose is to encourage past or present higher degree by research students, supervisors, or those interested in pursuing a higher degree by research, to connect, communicate and share resources and experiences. The challenge involves writing at least one blog post (you might write more!) and commenting on at least one other blog post in order to develop conversation and community. If you are new to blogging, the first step would be to set up a blog. I use wordpress.com, which is very user friendly, quick to set up and easy to manage. Ideas for your blog post/s might include the following. Sharing a celebration from or positive spin on your experience of being a research student. Exploring a question you have. Illuminating a challenge you have faced in your HDR journey, and how you approached or conquered it. Sharing a tip or technology. Exploring a metaphor for where you are in your HDR/PhD/Masters journey. Explaining a strategy you have for coping with the demands of a research degree. Using an image, animated gif or video as inspiration. Just make sure that, if it’s not one of your own, you attribute it to the site or person from which you got it. So, the steps for participating in this challenge are as follows. Step 1: Fill in your name and blog url here in this Google doc. Step 2: Write and publish your blog post. Step 3: Share your post in the Google doc and on the How to Survive Your PhD MOOC discussion board, if you are enrolled (but any research students, past research students, or supervisors of research students, or people interested in becoming a research student, are more than welcome!). Tweet your blog out using the #HDRblog15 hashtag. To extend your reach, you might also like to use other hashtags like #survivephd15, #phdchat, #acwri (academic writing), and #ecrchat (early career researcher chat). Step 4: Keep an eye on the #HDRblog15 hashtag on Twitter and the Google doc to read others’ contributions as they arise. Step 5: Comment on at least one other post. If you’re new to blogging, remember that reading on the web, including on a mobile device, necessitates information being presented in a way that is engaging and easy to process. This means a ‘hook’ to draw your reader in, a catchy beginning to grab the reader’s attention and short paragraphs readable on small screens and on the go. I find 800ish words is best; it’s meaty enough to explore a topic, but short enough to be readable in one sitting. I find if a blog post pushes over 1000 words, it’s getting too long and I try to think about how I can parameterise it to reign it in, or split it up. Visualise your audience when you are writing, to help you personalise the content and lead decisions about language, style, voice and approach. Are you writing for others in your industry? Other research students? Future employers? As a record of your own thinking for yourself? Blogging allows us to connect with others and develop ourselves. Your blog can be a free writing space where your persona can be unrestrained and experimental. I look forward to reading your contributions! * This post is in response to the How to Survive Your PhD MOOC 2015 ‘final activity’. * If you are a PhD student who blogs, take the time to complete this research survey for Inger Mewburn and Pat Thomson on why and how you blog. 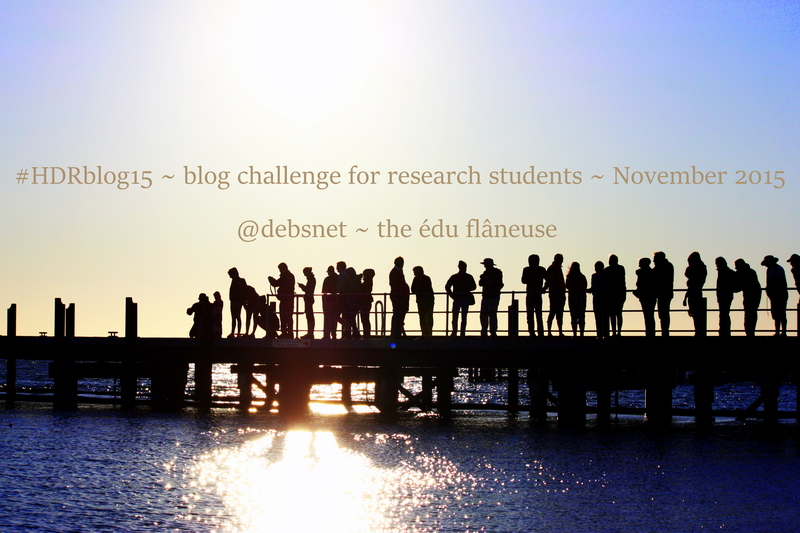 This entry was posted in PhD, Social Media, Writing and tagged #HDRblog15, #survivephd15, blogging, blogging challenge, doctoral writing, HDR students, PhD by Dr Deborah M. Netolicky. Bookmark the permalink. Oooh Deb – I wrote my PhD metaphor and sent it to Inger to get it out of my head and take away the feeling that I should set up a blog… I am a bit afraid of the procrastination potential and implied pressure to keep it going that setting up my own blog would create, but you are tempting me to think about it again! Kathryn, I’m glad I’ve got you thinking about it. I started this blog as a short-term experiment, and nothing to do with my research. It was a way to log a professional fellowship. Once I began, however, I found blogging to be a great way to develop my thinking and writing, and as a free outlet to ‘write loud’, without the rules of academic writing. Writing on my own terms. A well-devised challenge Deborah. This is definitely going to give participants a chance to expand on and learn from the experience. Thanks! Thank you, Stephan. I hope that we develop our network of others to support and from whom to learn. There’s such a wealth of story and experience out there. Second post up: goes live tomorrow at http://www.samyoung.co.nz/2015/11/practice-practice-practice-habit.html . By the way, I have also joined Buster and KelliAnne Benson’s http://www.750words.com, where you do a brain dump of 750 words each day. It is like meditation for writers. Check it out (while you are supposed to free-write, I am such a task-junkie, that after three days, I am a fortnight’s blog posts ahead. NOT what they intend, but stellar for organising my life ;-D). Great, Sam. That sounds great! And disciplined.